I have no memories of this project and I would love to know if it was before my time or when i was very young. 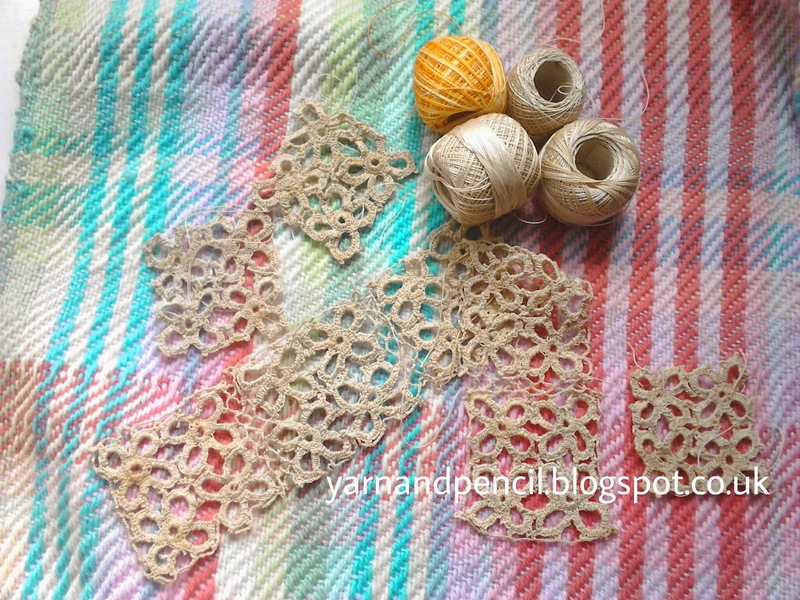 Mum has always been a crafter of all sorts but I cannot remember seeing her crochet except for when mum taught me as a teenager. I don't think Coats produce cotton thread like this anymore. I think I may make another cushion to go with the cushion I'm going to make with this. I know...another excuse to play! I will, of course, show you what the outcome is but it might be a little while as I am trying to finish the hand quilting on the vintage hexie quilt. ....not a good move as it caused me even more stress later that day when I realised it didn't read the way i had intended.. I found your blog on Pinterest and now follow you because of the Exmoor and West Somerset board! Hi Julie :-) Ah yes... I think I know who you are :-) Welcome! 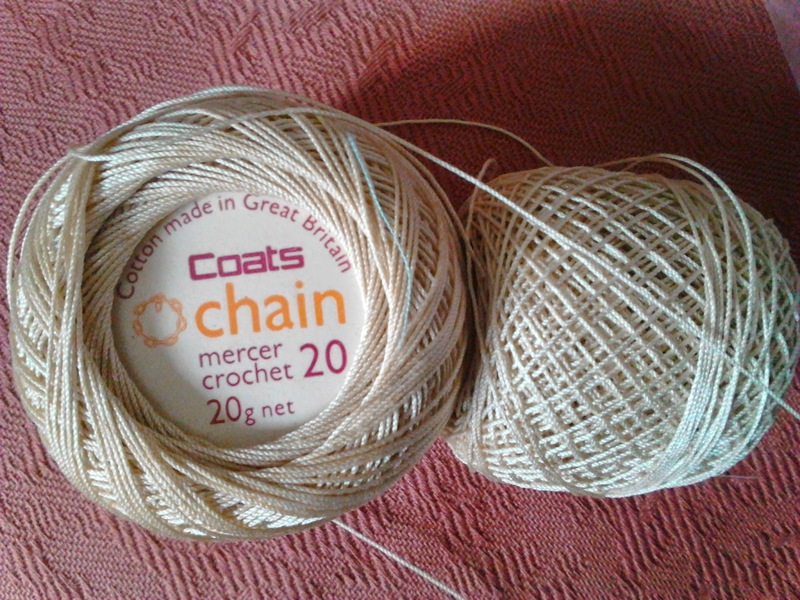 What I meant was that Coats no longer produce crochet thread, just sewing thread. 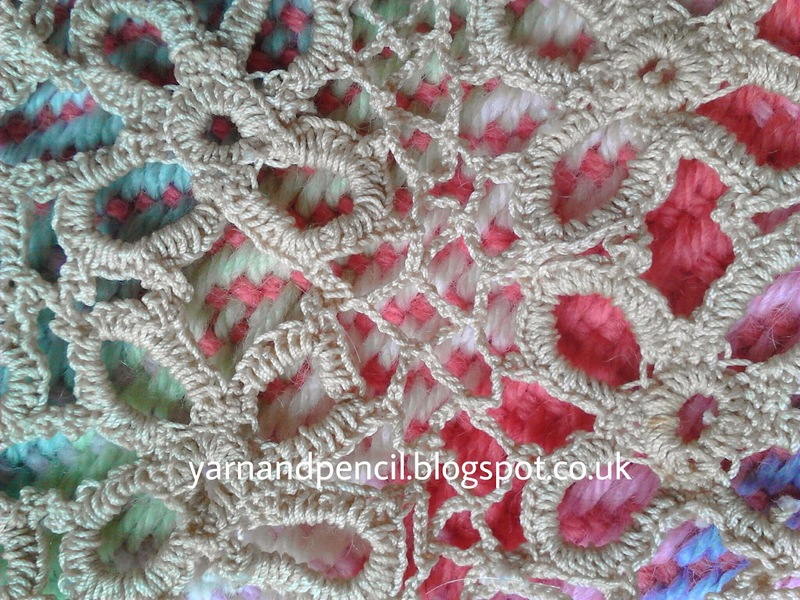 I have some crochet cotton if you would like it? That's very kind of you Julie :-) It would be very greedy of me to accept as I have a basket full already! Thank you so much for your kind offer though. That's me..............! I thought I recognised your photo but couldn't place it! I don't work with Sally any more, long story, well actually long story on both accounts. How beautiful, Tracy. Your mum is very talented. Thanks Amy :-) I shall certainly give it a try. Thanks so much for your support. 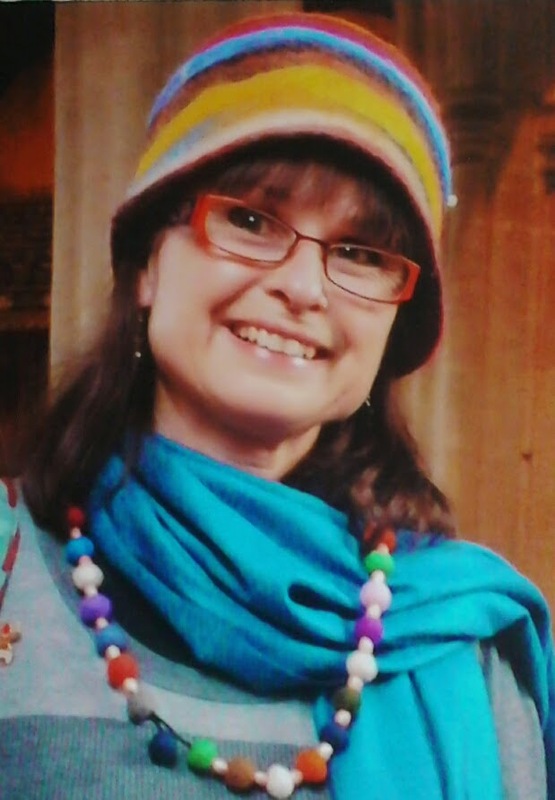 Hi Chrissie :-) Thank you, it will be lovely for mum to read everyone's comments. Yes indeed, it is very special. What a lovely forwarding gift from your mum, the pattern is exquisite, I look forward to what you make with the cotton yarn. My tah da moment is here on that French written pattern, I am really pleased how it turned out. 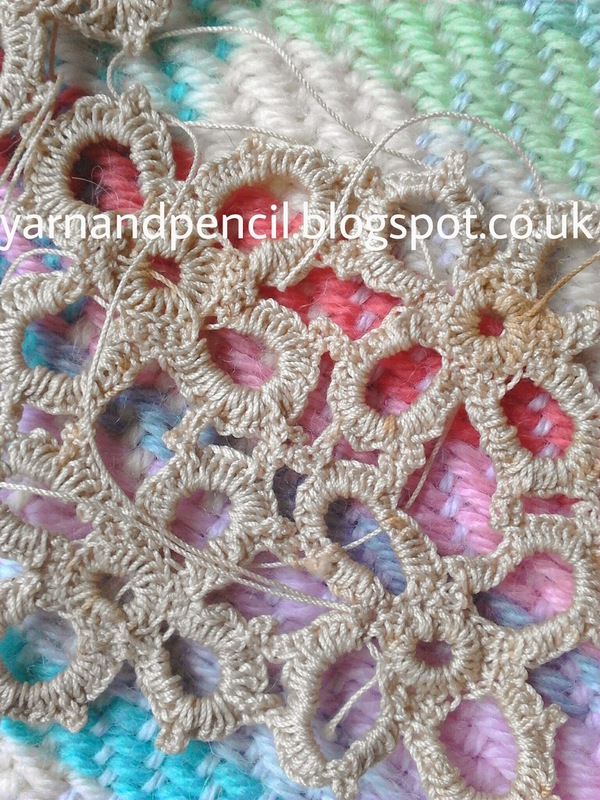 I have started a new project, I am working on it whilst I am on holiday. I am in Crete at the moment, the weather is gorgeous here. Thanks Linda :-) I love the top you have crocheted for your daughter...you are clever! I hope you had/having a fab holiday. 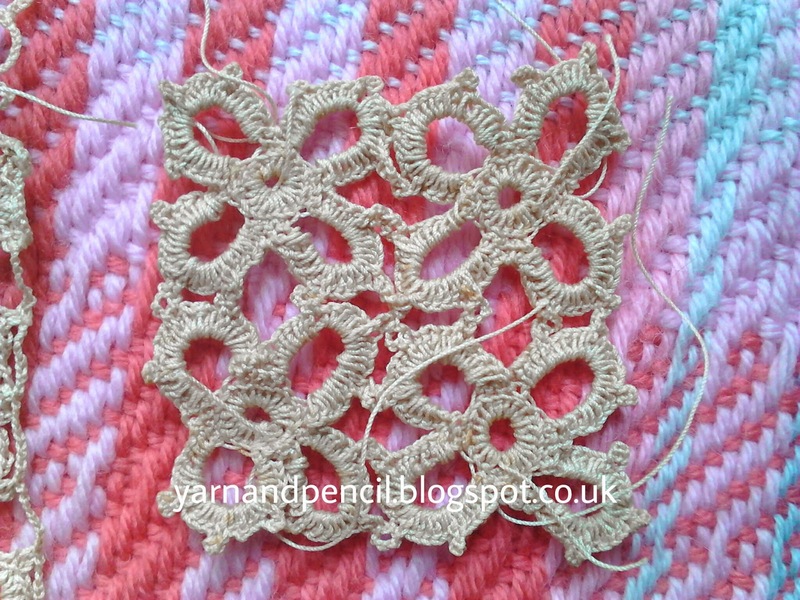 Gorgeous crochet from your Mum, so delicate and fine. I hope you enjoy finishing it off! Have enjoyed both your last posts re: your award. I know how much time goes into composing those award posts, so congratulations on the award and thank you for sharing about yourself! Oh thanks Linda, you are very kind :-) Isn't bloggyland a wonderful and supportive environment? 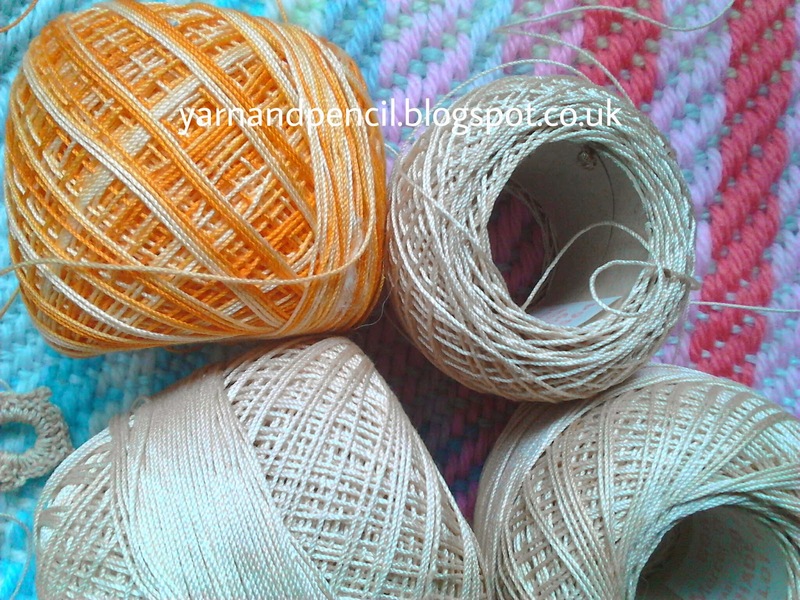 I love spools of crochet cotton, I cannot wait to see what you make with them, such a wonderful gift from your loving mum. Hello :-) Thanks so much for visiting and commenting. How wonderful of your Mum to gift you these cottons. I picked up some no 20 Coats cottons from the Hospice op shop a few weeks ago, ecru and that very same yellow gold variegated cotton. It had James Smith stickers on selling at $1.10. James Smiths have been closed for over 20 years! Isn't it a small world. I am making a table cloth with it. Enjoy! finished :-) I cannot imagine making something that big. What size hook are you using? Hi Tracey, hope you are having a lovely weekend. Thought I'd let you know I have started work on my Leibster posts. 11 facts posted last night and answering your questions today or over the next day or two. Thanks again, it's fun! What patience she has to make such lovely, delicate items. I love the yellow and can't wait to see what you come up with! Have a wonderful day. What a lovely idea about the journal. Are you going to decorate your new journal? Your blog slipped of my bloglovin radar again...how peculiar is that! Hopefully I am now following you again. I wonder if it's happened with other blogs I follow(ed) and i haven't noticed?